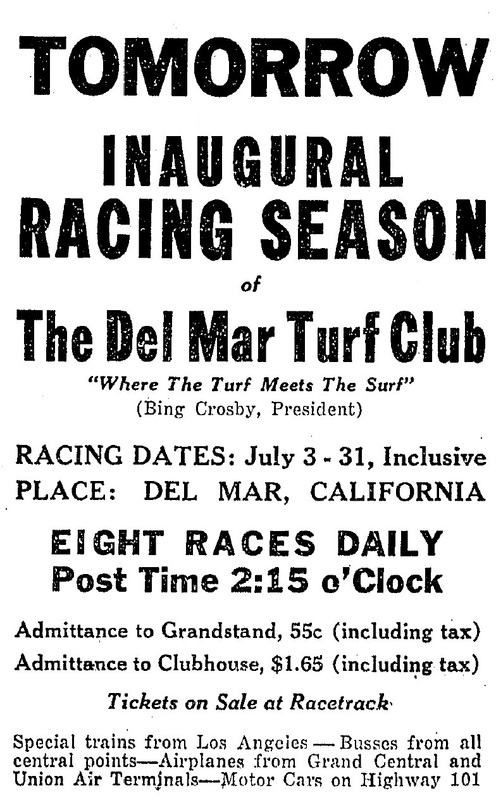 Racing returned to Del Mar for the 1946 season, but without its founding father Bing Crosby. 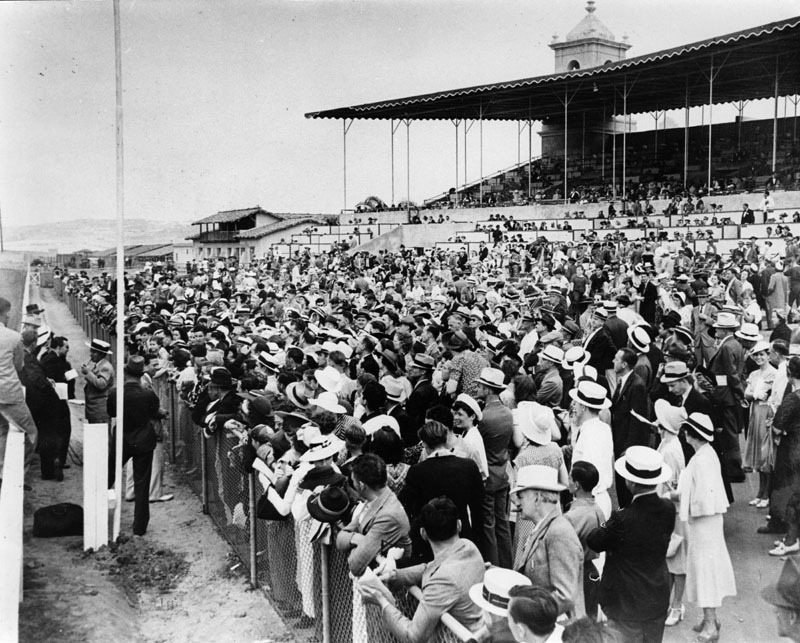 The Del Mar Turf Club, part of the San Diego County Fair complex, on July 3, 1937. Bing Crosby was one of the original investors and a driving force behind the venture. 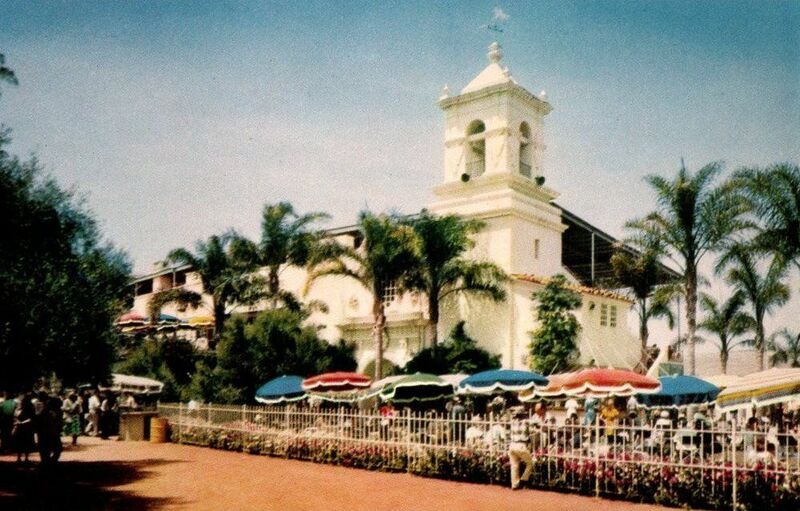 A federal grant from President Roosevelt’s Works Progress Administration (PWA) helped fund the construction of the racing oval, grandstands, clubhouse and stables, which were designed in a quaint Old California/Spanish/Mission style. With Bing Crosby, Bill Quigley, and Pat O’Brien at its helm, the opener attracted Hollywood’s horsey set: Gail Patrick and Bob Cobb (owner of the Brown Derby restaurants), Bob Taylor and Barbara Stanwyck, Toby Wing, Charles Ruggles, Lucille Ball (a blonde at the time), Chico and Zeppo Marx, Jack Warner of Warner Brothers and Harry Cohen of Columbia. With the US entry into World War II there was an effort to ban horse racing nationally for the duration, which finally succeeded in December 1944. Officially it was only a “request” by the Director of War Mobilization and Reconversion James F. Byrnes, but he found track owners surprisingly willing to comply, and in fact asked how else they might help the war effort. Del Mar track served as an aircraft factory, making wing assemblies, nicknamed “Bing’s Wings” for Flying Fortresses. 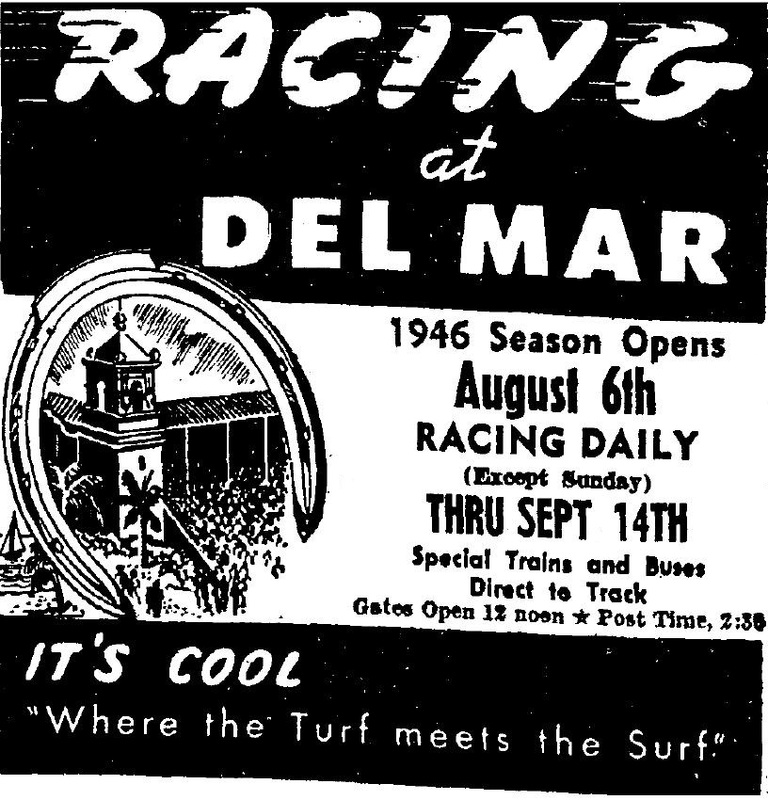 In May 1945, with victory in Europe achieved, although the war raged on in the Pacific Theater, the racing ban was lifted and Del Mar was able to open for its 1945 summer racing season as usual. In the midst of the meet came the news of the Japanese surrender and the war was finally over. But rumors were percolating in late 1945 that Crosby intended to sell his share in Del Mar. And on April 22, 1946, Crosby announced that he had done so. Pat O’Brien and Edgar Bergen followed suit. 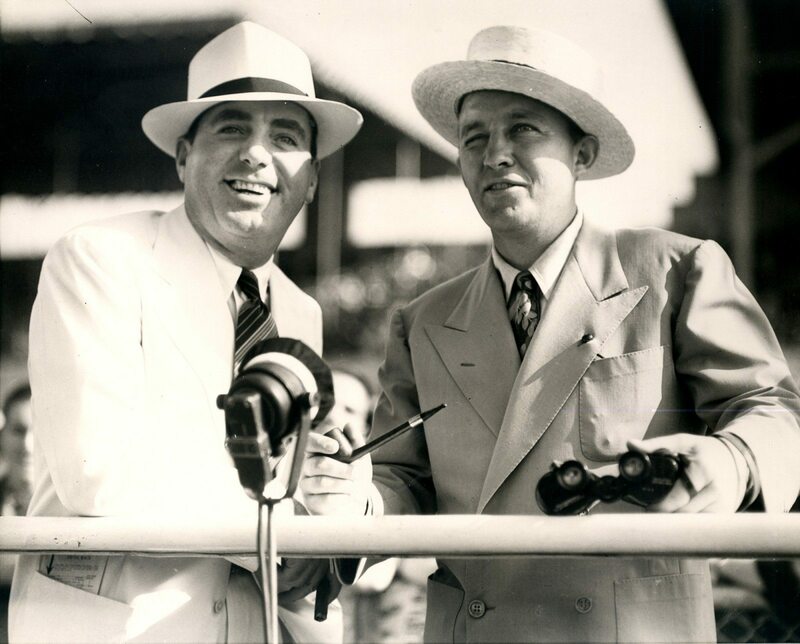 So, on August 6, 1946, the first full postwar racing season opened without Bing at the helm. Broadway producer Mike Todd, as one of the new directors, ensured that Del Mar did not entirely lose its showbiz flare. Track attendants were costumed in Spanish garb, and while Bing wasn’t present at the opener, he was there in spirit. The new owners created the “Bing Crosby Handicap” in his honor, and played a record of his song “Where the Turf Meets the Surf” for old time’s sake. 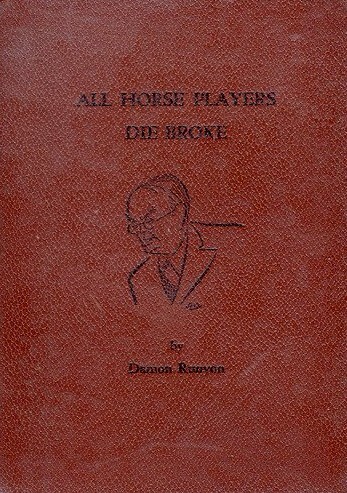 1946 opening day visitors to the enclosure received a little book, All Horse Players Die Broke, a collection of Damon Runyon horse racing short stories, printed for the occasion. Special copies were presented to newspaper sportswriters, with their names stamped on the cover in gilt. Runyon died on December 10, 1946.